With its smooth glossy surface and slight shade variation, the Jeffrey Court Aluminum 4 in. x 12 in. Glass Wall Tile can be installed alongside mosaics (sold separately) to create a coordinated look. Penetrating sealers recommended before grouting. Tile containing metal may not be used where there is consistent moisture, in wet areas or submerged, this included but is not limited to showers, steam showers, fountains and pools. 1 square foot per pack, 3 pieces per pack. Pack weight equals 3.96 lbs. Buy online Jeffrey Court Aluminum 4 in. x 12 in. 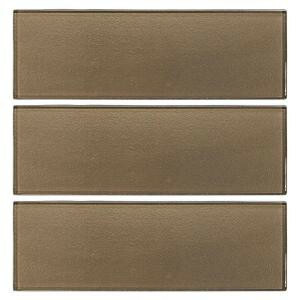 Glass Wall Tile (3-Pack) 99787, leave review and share Your friends.